Friday 13th this year was not a day to avoid. Instead it saw the start of the two-day celebration that is ArtReach Night of Festivals. This is the fourth time that the festival has been brought to Nottingham. Once again, City Arts was at the heart of the event, bringing together international artists and companies with local artists and participants. We worked closely with Carnival specialists Mandinga Arts and Paraiso School of Samba, and our Dome was centre stage in the festival village on Nottingham’s Market Square, hosting an exciting programme of performances, workshops and events. Over the past month City Arts has been host to dance workshops with Mandinga and samba drumming master-classes with Paraiso. Groups brought together by City Arts have learned choreography and how to animate puppet characters, as well as further developing samba percussion skills. 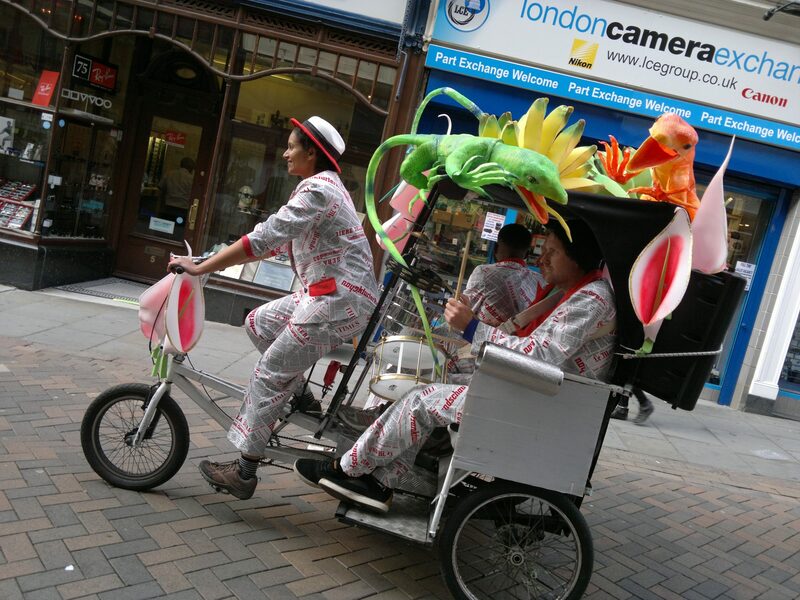 During the two days of the festival, carnival relay performances ensured that Market Square was constantly animated and full of colour, music and dance. 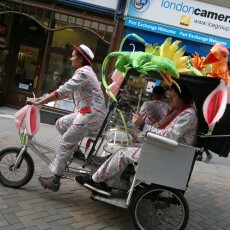 Passersby were delighted by samba dancers, costumed characters and three drummers in a rickshaw! The event was a great success. The rain on Friday evening didn’t dampen the spirits of all the carnival performers, who just danced through the drizzle, and the sun shone on us on Saturday, drawing in the crowds. Night of Festivals is always a fantastic event, with great artists and some really exciting opportunities for the public to get involved in. It is great that is has come back to Nottingham again, it has given us all a change to build on the relationships with everyone involved, and it means there is always a great sense of expectation and excitement. If you missed it Night of Festivals, or want to see it again, the event is on tour, and will be in Boston, Lincolnshire on 13th & 14th of October, and Slough and Leicester next year. Night of Festivals Touring Nottingham was supported by Arts Council England’s Strategic Touring Programme and Nottingham City Council.